The madmen who are responsible for the coming economic disaster continue to behave as if they can manage to avoid it. Violating Einstein’s definition of insanity, they continue to apply the same poison that caused the problem. These fools believe they can manage complexities they do not understand. We are bigger fools for providing them the authority to indulge their hubris and wreak such damage. So writes Monty Pelerin (economicnoise.com) in edited excerpts from his original article* entitled Extreme Fear Is Reasonable. The relationships in this graph are terrifying! Debt is shown relative to GDP. GDP growth has been one-third the growth in debt for the period. That is, the economy required $3 of debt to produce $1 more in real GDP. In recent years diminishing returns to debt required $6 of debt to increase GDP by a $1. Whatever the benefits of debt, they have clearly diminished, almost to zero. Debt expansion has gone exponential in order to salvage the weak growth in GDP. The “family” depicted above has to borrow each year in order to maintain its spending level. Imagine the condition of your family if you borrowed 6 times the amount of incremental spending each year. Then imagine the condition of your family after 40 years of continuously increasing your debt levels substantially in excess of your income. It is impossible for a family without a printing press and a cooperative Federal Reserve to engage in such behavior. The government is different, you say? Surely it is, but not necessarily in a meaningful financial manner. Just as you would not survive such behavior, governments cannot either. History is full of examples of government collapses resulting from excessive debt and overspending. A printing press only provides the luxury of more time before the failure. You may…[be of the opinion] that a macro economy is different from a family, [that is, that] debt (parroting the political claim) makes an economy grow faster. The evidence shown…[in the chart above, however,] does not support that claim. Government reported GDP growth rates are shrinking as the debt expansion accelerates. 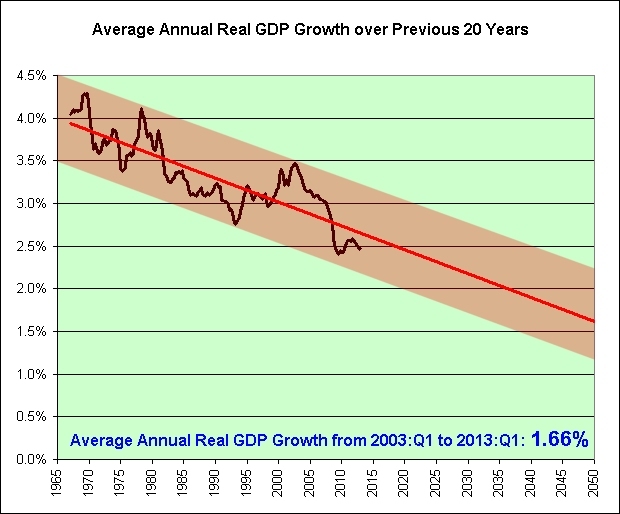 Since 1965 the growth rate of the economy has been declining. Even if you accept government GDP reporting, the chart…[above] shows a trend…[that] points to an average declining standard of living. That point will be reached when the GDP growth falls below the population growth. The U.S. economy has been underperforming since the 1970s according to government’s statistics. That is after all the games have been played with these numbers. How much longer can these trends continue and what happens at the end? No one can reasonably answer either of these questions. So long as borrowing increases faster than GDP, the ability to repay diminishes. That has been occurring for more than forty years and the differential growth rates have widened dramatically in recent years. Not borrowing at this pace would likely have decreased reported GDP dramatically. While that may have been a proper economic response, it is now politically impossible (or highly unlikely). 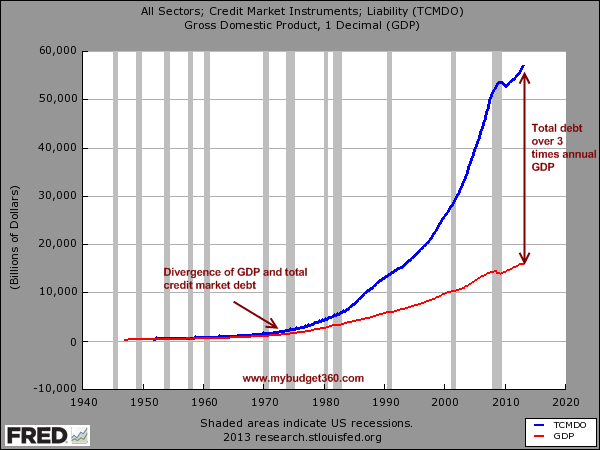 Continuing to increase debt at a rate greater than GDP ensures financial collapse. Stopping or slowing down at this point likely leads to the same point. This country has maneuvered itself into a no-escape situation. …Those in favor of more debt argue that a calamity would have occurred had the massive rise in debt, and its accompany stimulative effects, not happened. For the Paul Krugmans of the world, more debt and stimulus is always the answer. The rapidly increasing amounts of debt since 1965 have been accompanied by not rising but falling rates of growth. One may speculate what this growth would have been with different rates of debt expansion. Whether the rate of debt expansion increased or decreased the rate of real GDP is moot. Economists can use their competing paradigms to duel over this issue but cannot come to a conclusion that is acceptable to most. Mathematics, on the other hand, is more definitive. There are mathematical limits that control the ability to service debt. Once these limits have been breached, some amount of the debt will be defaulted on. 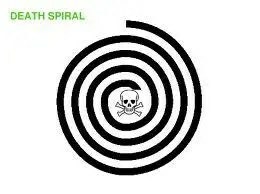 The breach point is referred to as a debt death spiral. The U.S. has passed this mathematical point and is in a death spiral. The political class in America, either via misguided economic policies or a deliberate attempt to hide the true condition of the country, has put us here. They will continue to employ whatever policies they believe will keep things going for a while longer. The tragic ending has been cast. Economics cannot trump mathematics. 6. Gov’t Debt Will Keep Increasing Until the System Implodes! Are You Ready? 11. Take Note: Don’t Say You Weren’t Forewarned! The video* below is one of the best overviews of what is going on and one of the best explanations of what lies ahead that I have heard. As such, in my opinion, it is A Must Watch! The internet is awash (drowning?) in hundreds of doom and gloom videos providing dire warnings of coming world depression, food shortages, rioting in the streets, rampant (hyper) inflation, deepening banking crisis, economic apocalypse, financial Armageddon, the demise of America – well, you get the idea. Below is a small sample of such videos with a hyperlink to each. Economic Reason has gathered together the Top 18 ‘reality’ economic documentaries which are bought to you by www.munKNEE.com. This short video – on the sustainability of government spending – should be watched by everyone, including those not yet old enough to vote. It should be shown in every high school and college classroom. 18. A Disaster of Unprecedented Proportions (The End Of The World As We Know It) Is Coming Sometime This Decade and It Will Be Irreversible! 19. The Average U.S. Citizen Is Clueless Regarding the Desperate Shape the Country Is In! Are You? 27. What Will the Outcome of All the QE Mean for the U.S. (and the World)? As if knowing you are going to die..and can do nothing. The Global “Economy” is now but a biased shadow of what it was a decade ago as the Central Banks continue to print money overtime and enable their countries Ultra Wealthy to sell Gold using naked shorts, which has the effect of scaring small to medium investors into selling their PM’s because of fear and/or need. As the numbers of those with money to spend continually decline, thanks to current monetary practices, the “Global Economy” will continue to collapse, which at some point in the near future cause the current fiscal version of the fiscal-musical chairs game to end with those only holding flat money left out of PM’s recovery! I view PM’s, like I do insurance, you purchase it because if something unexpected happens, you don’t want to pay the entire bill for it yourself. Yes, until that something happens you are paying for your insurance (think not making any money from the money invested in PM’s), but that amount is small compared to what you might lose should disaster strike (dramatic loss in value of flat money) which would then require you to accept a huge reduction in the value of your portfolio. What percentage of your income do you spend on Insurance? Let us compare insurance to PM’s. You purchase insurance because if something unexpected happens, you don’t want to pay the entire bill for it yourself. Yes, until that something happens you are paying for your insurance (you do not make any money from the money invested in PM’s while you hold it), but that amount is small compared to what you might lose should disaster strike (consider a dramatic loss in value of flat money) which would then require you to accept a huge reduction in the value of your net worth ( loss to your portfolio because you have no gains in the value of your PM’s to offset the loses to your flat money. What percentage of your income do you spend yearly to “own” Insurance? Perhaps the same percentage should be used for your PM holdings in your portfolio! Because how many readers consider having no insurance as prudent?